I am entirely Middle-Eastern on mine (99.1%). Looks like this is only going to be informative for Europeans or those of continental mixes. [Edit]: Note that the "Middle-East" here, for whatever reason, is Syria, Turkey and Iran. Not sure what this grouping was based on. I verified the Scandinavian from him because all my Scandinavian RF cousins come from him. The Native American was unknown before now: never showed up before and frankly at that level is probably untraceable, and maybe just noise? Last edited by Little bit; 12-07-2012 at 12:08 PM. 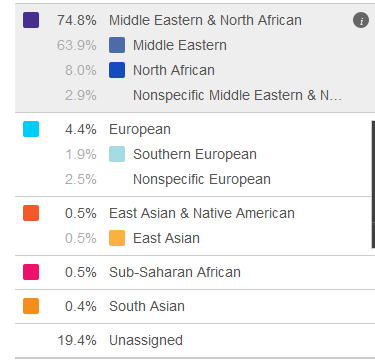 After checking a few of the results it seems like the "Middle-Eastern" category here is basically equivalent to "West Asian" on ADMIXTURE runs. The Arabian peninsular sharing contacts I have score as a mix of North African and Middle-Eastern, whereas Iranians tend to predominantly be Middle-Eastern. Here is my ‘Ancestry Composition’. Accurate, but boring. Shorthand: R-L217 or R-S1849......................................Extra Mutations: 309.1'C', 315.1'C', A16235'G', T16357'C', C16519'T'. Last edited by Silesian; 12-07-2012 at 05:27 PM. It looks like the new tool can identify British and Irish easily enough. My mother is mainly Isles ancestry by a fair margin, and ends up with 43.9% British + Irish, 3.0% French + German (which is slightly low but close), and a whopping 50-odd percent Nonspecific Northern European/Nonspecific European, in addition to 0.1% South Asian (some remote Romani ancestry is plausible but not documented). Her sister -- my aunt -- has 31.7% British + Irish, 0.1% Scandinavian (again plausible considering coastal English/Irish/Scottish ancestry), 0.5% Iberian (probably feeding into known French ancestry), and the rest Nonspecific Northern European/Nonspecific European. Almost all that "nonspecified," by paper trail, is English, Scottish, Irish, or Welsh, with a small amount of Dutch. My mother's contributions to my DNA show up as 25.4% British + Irish, 4.9% French + German (more accurate than my mother's assesment), and the rest Nonspecific Northern European. My paternal contributions end up primarily Ashkenazi with some Eastern European and fairly large Nonspecific European and Unassigned blocks, much of which probably represents Sephardic ancestry. So I think it is safe to say that while a very high proportion of British + Irish is excellent evidence of such ancestry, a somewhat lower proportion of 30-50% with a large amount of Nonspecific Northern European does not preclude majority or perhaps even full Isles ancestry. Places: Yorkshire, Lancashire, Birmingham Warwickshire, Worcestershire, London, Denmark, Cumbria, Scotland.